Do you love spending time on Pinterest ? How many times do you turn to Pinterest for ideas for parties or buying gifts ? As google , Pinterest is also a search engine, more specifically, a visual search engine. When you search with a query, you get relevant pins come up in the feed. It is called smart feed. So keyword rich description is a must along with beautiful relevant pins, to show your pins to those people who are not even your followers. Earlier Pinterest allowed long descriptions. But as of now, it has started shortening the description. Here you should be as specific as possible. You can write about 300 words for description but only few words would be visible in the grid. Whole description will be visible only if someone clicks on the pin. So now you have to write a crisp description so that people could see it. Specific pin description with rich keywords will to rank your pins in searches. Pin description with keyword rich is mandatory for not only pins but also for your boards. Keywords are the words which people search for on Pinterest. These are 1 to 3 word queries which people use to find information. Like google, Pinterest also uses longtail keywords to show relevant search results. For example, I want to design a pin for my Side hustle blog post. I will search with the word Side hustle in search bar. It will come up with some suggestions. Here I types side hustles in search bar and I got so many suggestions in second bar. From here , look from left and make your relevant sentence.” Make extra cash with these side hustles while staying at home”. This could be your description and if you want , you can add more. 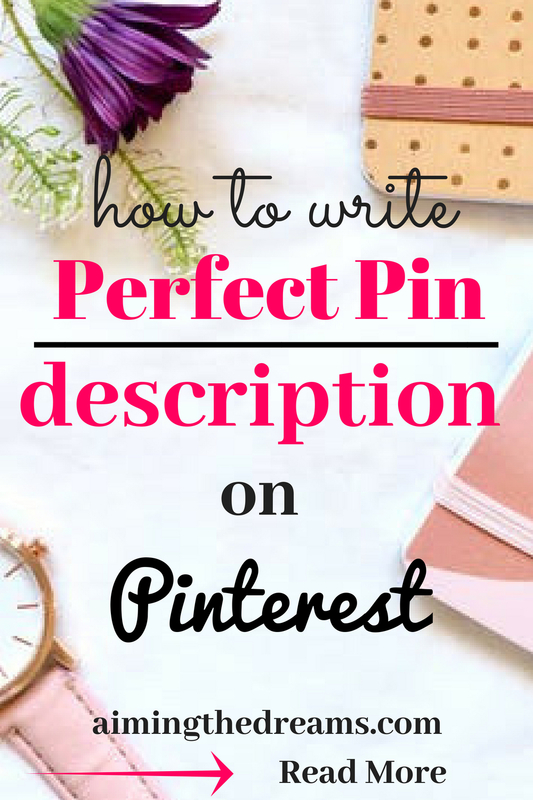 Pin description should be attractive so that viewer would click to your blog post and it should have keywords beautifully woven into description for Pinterest to read those for smart feed. Now, as you know keyword rich description as well as engagement of the pin are important for your pin to go viral. Suppose somebody found your pin and liked it and pinned or shared it. Now your pin is visible to more people. This way your engagement has increased. Increased engagement along with keywords do wonders. Beautiful pins are required for engagement on the pins but before that, those pins should be visible to viewers. It means , Pinterest should be able to read about your pins. And your beautiful pins should be relevant to the search for what people are looking. 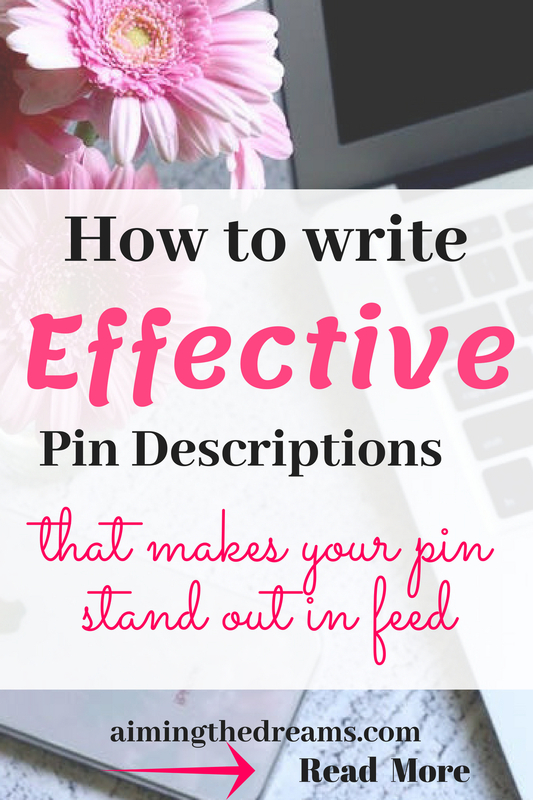 Keyword rich descriptions come into play when Pinterest have to find out the relevant pins. I am writing this assuming that you use wordpress for your blog. When you open your image on wordpress to edit, you will see a space for Alt text. Write description in Alt TEXT because when somebody will pin images from your post directly, Alt text will become your pin description automatically on Pinterest. Write your Alt text the same way with keyword rich description as you would write while uploading your pin to Pinterest. 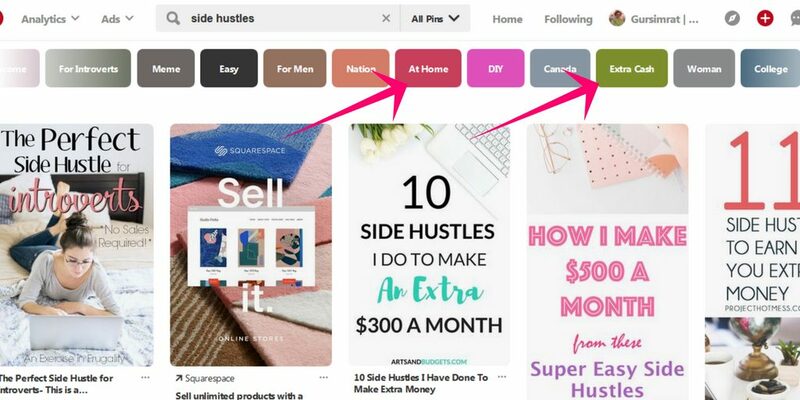 As mentioned above, find your keywords by typing into the search bar of Pinterest your keyword. And write description from there on. Pinterest can read your image as well as text overlays. It is as important to write keywords naturally on your text overlays as in pin description. With this, Pinterest will be able to read your image as well as description. But be mindful about stuffing keywords. Don’t just stuff them, instead make sentences which appears natural and meaningful. Pinterest was not keen on using hashtags until now. But as of now, Pinterest has allowed the use of hashtags. Pinterest is giving priority to the pins with relevant hashtags in searches. If you haven’t used hashtags till now, it is time to start using. Hashtags also helps in ranking higher for your pins. Use hashtags for your keywords which are relevant to your pin as well as your post. Unrelated hashtags will not help your account rather it will have opposite effect. Nearly 20 hashtags are allowed in one pin description. Don’t use more then 20 hashtags in one pin description. Please share this post if you like it. These are the points I always remember while writing descriptions for my pins. Hope it helps in gaining momentum to your pinterest account as well as your blog or business. Thank you so much for your insight! I learned some things here: I never paid attention to “Alt text” before; I didn’t realize Pinterest could read my images, so I’ll be smarted when writing text on my image. Simone told me about hashtags and keywords. Thanks, too, for telling me about how to find keywords on Pinterest. This is a good, helpful post. Good job, Gursimrat! Thank you Cindy,for your kind words. And yes Alt text plays a good role in pulling pin descriptions when somebody pin from your website. Go for it Cindy. It will help you in growing your blog traffic. And when you say blessings, I really feel blessed. Thank you. I love this post! Your tips are straight forward and easy to understand. 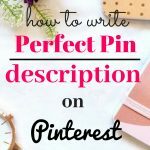 I’m excited to start using your method for pin descriptions right away! Thanks Nicole for stopping by and reading. Yes this method for writing keyword rich descriptions really work. Go for it. Great information, wasn’t aware of the ALT description, thank you so much for sharing. Thank you Evelyn, yes it helps because Alt text becomes your pin description when somebody pins from your website. Yes John, Pineterst gives so much importance to SEO. Thanks for reading and commenting. These are some great tips for creating a good pinterest image. I really should add text overlay to mine! Thank you Eileen for reading and commenting.Your images and blog both are always beautiful. Go for it. Terrific article G! Thanks so much for all the great info. I found some tips I really need to start implementing. Thank you Simone for the appreciation.